It has always been a part of our family. An unwanted dinner guest who just wouldn’t leave. I am talking about Diabetes. Diabetes is an urgent health problem not only for my family but the entire Latino community. The rates of diabetes among Hispanics are almost double those of non-Latino whites. It hit especially close to home when my mom passed in 2001 from a diabetic heart attack. Unfortunately, the chronic disease also runs in Art’s family. Talk about a double whammy! With the two of us being hefty gals, we figured it is time to create healthier recipes that won’t spike our blood sugar levels, and yet still meet our high demand for good-tasting food. Is it me or do avocados add something to dishes that make them taste extra special — even the healthier versions of traditional dishes? Maybe it’s nostalgia as my parents had two avocado trees on their property, one of them being Hass. Many of our family celebrations incorporated avocados in the dishes: salsa with chunks of avocado, thick and spicy guacamole, green salads with cubes of avocado, and so on. So when my husband and I learned avocados have 8% of your daily recommended value (DV) of fiber — we thought HOORAY!! Keep in mind, fiber adds bulk to your diet and can help provide a feeling of fullness. This is an important fact for two “hangry” osos on a diet. Avocados are virtually the only fruit that contains monounsaturated fat, and they are sodium, cholesterol and trans-fat free. More reasons to celebrate! 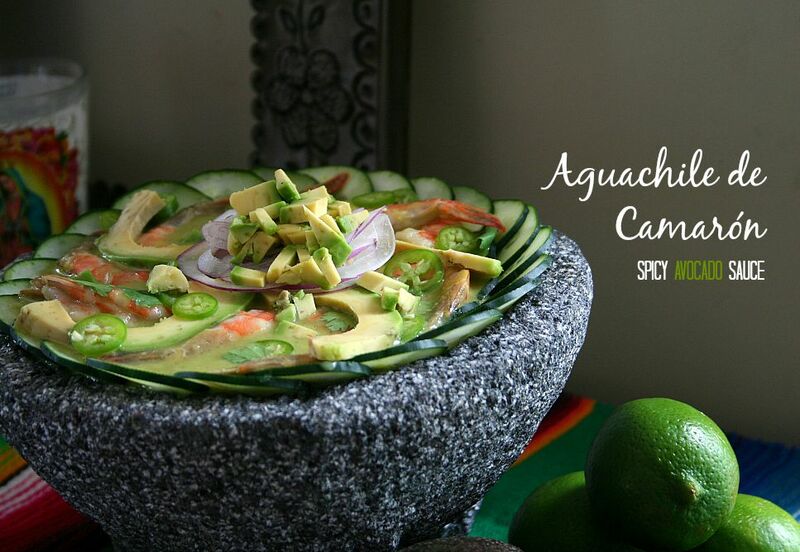 For this campaign, we created a traditional Mexican seafood dish with avocado that is healthy and flavorful. The shrimps swim in a luscious green Hass avocado sauce that puckers with lime juice, cilantro, and blended serrano pepper. Build yourself a beautiful tostada with the Aguachile and add cucumbers, red onions, and more chunks of the buttery avocado. 1. Combine the lime juice and shrimp in a large non-reactive bowl, like glass. Make sure your shrimp are submerged, cover with plastic wrap and refrigerate for 30 minutes. Stir the shrimp halfway through just to make sure the shrimp all get a chance to cook. 2. Make your avocado sauce by combining all the spicy avocado sauce ingredients in a blender and puree until smooth. Reserve. 3. 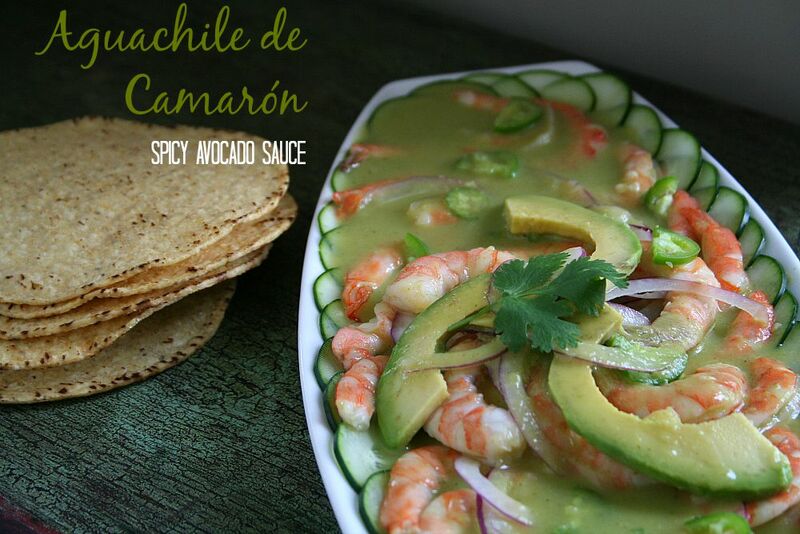 Once your shrimp have cooked through in the lime juice, stir in the spicy avocado sauce. 4. 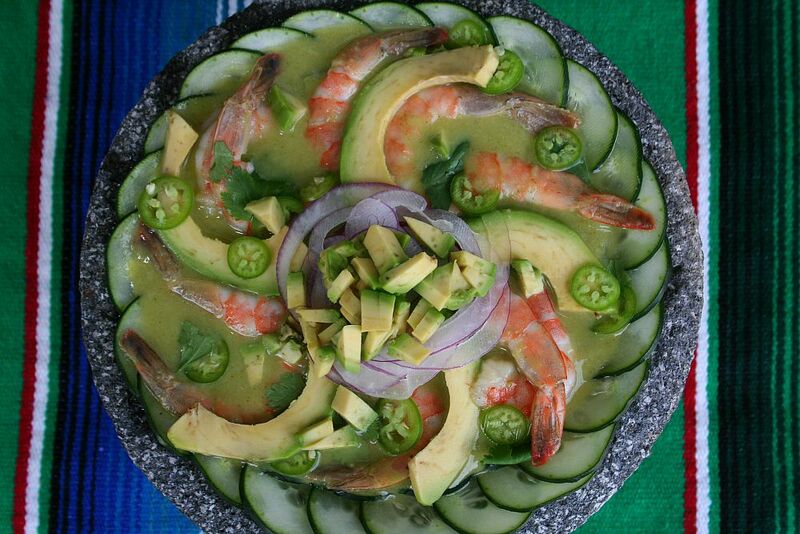 To serve, arrange the cucumber slices on a platter/bowl and top with the shrimp and plenty of the spicy avocado sauce. Add the red onions and serrano peppers. Just before serving peel and pit the whole avocados and slice them into half moons and arrange on top. And for a chance to win prizes I invite you to share your favorite homemade avocado recipes and follow the #SaboreaUnoHoy 10-day photo challenge. You can also connect with the Hass Avocado Board on Facebook, Twitter and Instagram. 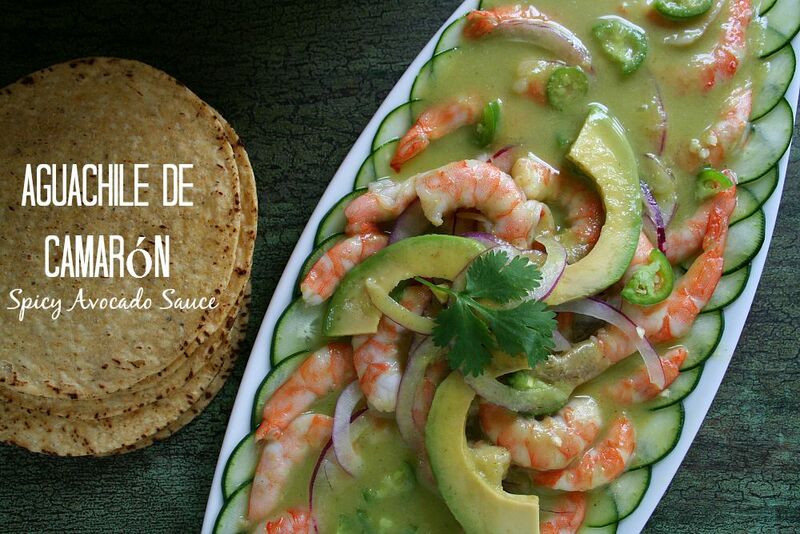 Find recipes in Spanish at www.saboreaunohoy.com/aguacatesydiabetes or in English at www.avocadocentral.com/loveonetoday. This is a wonderful resource for wholesome and flavorful dishes using Hass avocados. Fantastic post. I’m a huge avocado fan having grown up in SAN Diego. Looks delicious! Thanks Jeff! We love compliments and YES is was delicious. It was just the two of us eating over 2 pounds of spicy aguachile…but so good! You’ll have to try and make it!